No matter when and where it happens, broken glassware is an inconvenience at best. But when laboratory glassware breaks, it can do a lot of harm. Injuries from broken glassware can range from a small cut to a serious health risk. These injuries may occur when dropping glassware and when handling fragile glassware or flawed glassware. They can also happen if you come into contact with glassware that hasn’t been disposed of properly. In rare cases, glassware can explode or implode due to pressurization or a chemical reaction. Broken glassware can also be a health risk if it is contaminated. While safe procedures are important in any lab, the following practices help prevent injuries from broken glassware. When you work with glassware, it is important to wear all required PPE. But even if you are wearing PPE, if you notice glassware falling from a countertop, let it drop. If you happen to drop glassware during use, let it drop. Catching glass may cause it to break in your hand, resulting in cuts, punctures, or other injuries. Many facilities do not allow employees to use their hands to clean up broken glass. Even if it is allowed, you should avoid using your hands if you can. Instead, use tools such as forceps, tongs, or a broom and dustpan to clean up broken glass. If you must use your hands, wear gloves made of leather, heavy canvas or cut-resistant material. Latex, nitrile, and other chemical-resistant gloves will not provide protection against broken glass. If your broom or brush cannot pick up small shards, carefully use wet paper towels, absorbent pads, or rolled up tape to pick them up. To prevent injury, use your facility’s policy to determine the best way to dispose of the broken glassware. For example, you may conduct an experiment that contaminates glassware. In cases like this, special disposal and labeling of the container may be required. Consult your supervisor and your facility’s policy for specific disposal requirements. Laboratory glassware can be dangerous if used or disposed of improperly. 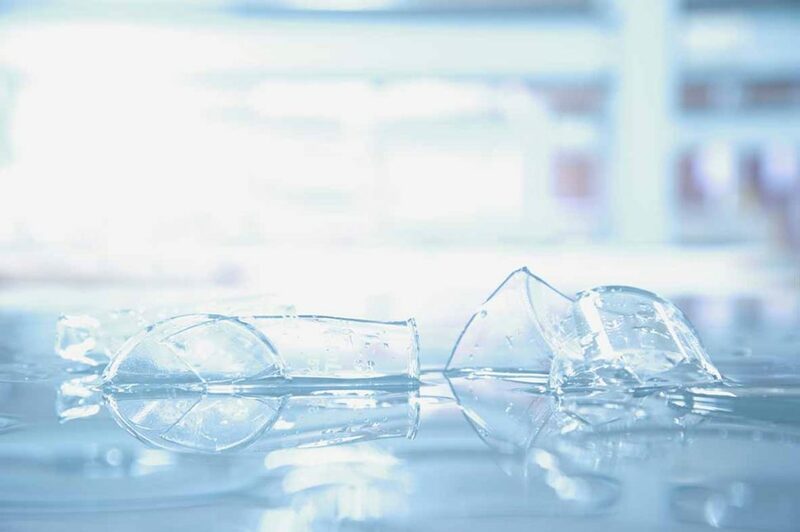 When dealing with broken glassware, safe handling and disposal practices can help reduce the risk of injury. SafetySkills covers these topics and more in our Glass Handling and Breakage for Laboratories course. For more information, click here. Try SafetySkills free for 14 days! What is a Chemical Hygiene Plan and Why Does Your Lab Need it?